Technology holds great potential for rural schools, such as extending the reach of excellent teachers and expanding course offerings. 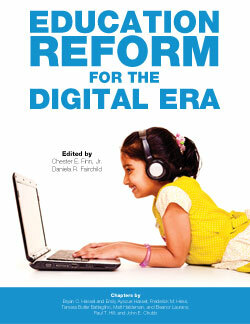 But digital devices in a pre-digital school structure will not transform K-12. This paper, written for the Rural Opportunities Consortium of Idaho, offers policymakers and philanthropic leaders a set of recommendations to capitalize on the potential of technology to serve students: expand broadband access to schools lacking it, create an elite corps of proven teachers who would be made available to students across the state, and provide districts and schools with the flexibility to develop new models of staffing and technology and to achieve the most strategic combination of personnel, facilities, and technology. Blended learning that combines digital instruction with live, accountable teachers holds unique promise to improve student outcomes dramatically. This brief explains how schools can use blended learning to encourage improvements in digital instruction, trans­form teaching into a highly paid, opportunity-rich career that extends the reach of excellent teachers to all students and teaching peers, and improve student learning at large scale. We call this a “better blend”: combining high-quality digital learning and excellent teaching. In this blog post for the Innosight Institute (now the Clayton Christensen Institute for Disruptive Innovation), Bryan Hassel and Emily Ayscue Hassel argue that “schools – and nations – that excel in the digital age will be those that use digital tools both to make teaching more manageable for the average teacher, and to give massively more students access to excellent teachers.” While digital learning can help solid teachers become more effective, one of its greatest promises is to enable top teachers – those whose students already achieve well over a year’s worth of growth – to educate more students by freeing up their time, allowing them to teach students who are not physically present, and capturing their teaching prowess by recording videos or helping develop smart learning software. Blended learning is poised to transform American education by personalizing student learning – uniting the highest-quality online content with highly-effective educators in “live” instruction and supervisory roles. This white paper from Innosight Institute (now the Clayton Christensen Institute for Disruptive Innovation), the Charter School Growth Fund, and Public Impact defines six models of blended learning, provides vivid examples of blended learning in action, and discusses both the technology and policies needed to realize the promise of blended learning. The white paper highlights the importance of creating policy environments that grant innovative educators autonomy, enabling them to design and implement models based on affordable quality and personalization. In these policy environments, the focus of regulation must not be on input-focused rules, but on accountability for outcomes.